What?! A six pack without doing a single crunch? Sign me up!!! Here are 6 effective exercises you can do at home without equipment and without ever doing a single crunch! They will shred your core, strengthen your upper and lower body and burn body fat. For maximum results do the circuit listed below at least 3 times a week. Do each exercise for 30 seconds without any rest between exercises. If this is too challenging for you allow yourself to rest in increments of 15 seconds and then challenge yourself by gradually lessening the time in between exercises. Repeat this circuit 3 times, resting for 30 seconds to a minute in between circuits. To make the circuit more difficult do not rest at all in between the circuits! 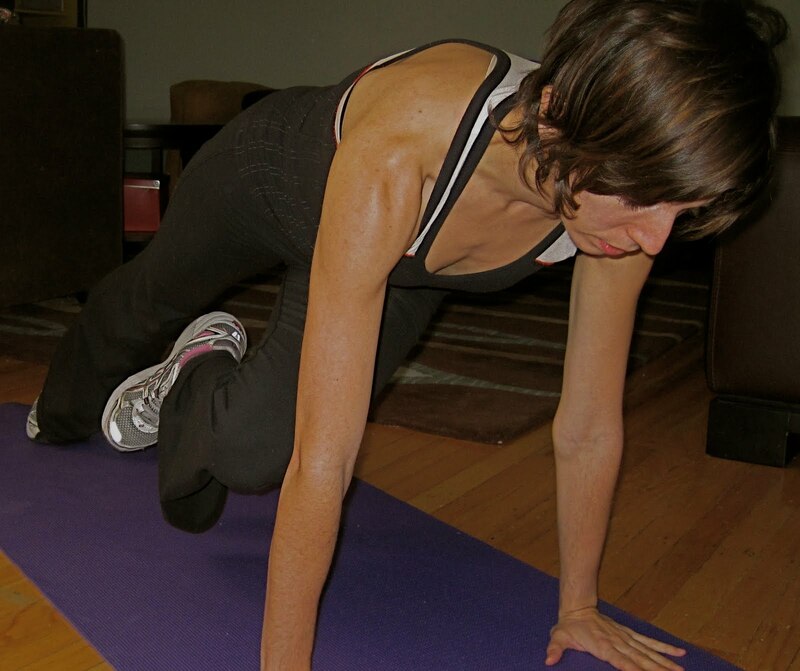 Get into push up position on hands and toes, or on elbows and toes. Contract your abdominal muscles (and core). Keep your back straight (don’t collapse in the middle) and hold this position for as long as you can. Start on your hands and knees and get into in a sprinter’s start position. Keep your hands on the ground and push off with your feet so you alternate foor placement (run in place) as long as you can. Be sure to keep your back straight, not arched. Stand with feet together. Squat down and place your hands on the floor next to your feet. In an explosive movement, jump feet backwards into a push-up position, jump feet back between hands and stand up. We took a video of this move but I wasn’t able to upload it. If you need a visual, think Burpee from high school gym class-haha…sounds funny, but it’s a tough one! Lie on your left side. Place your forearm in front of you onto the mat. Position yourself so that only the forearm of your left hand plus the left side of your hips and legs are in contact with the floor. Position your other hand either palm down onto the mat in front of you or behind your head. Maintain good core body posture and balance by first using your right hand as leverage on the mat. Set your left leg directly atop the other. Brace the abdominals. Begin in push up position, on knees or toes. Perform 4 push ups, abs in and back straight. On the 5th push up, lower halfway down and hold for 4 counts. Push back up and repeat the series. Start on your hands and knees and get into in a sprinter’s start position. Brace your abdominals as you bring your right knee forwards and across the body towards the left elbow or armpit, keeping the foot close to the ground, but don’t allow it to touch the floor. Extend the leg back to the start position and repeat on the opposite side. Angela has a unique gift of helping people transform their bodies into lean muscle machines (I’m still working on mine!) She’s tough but she truly cares about her clients. I have been impressed and inspired by her since I took up Pilates a couple years ago. She’s the real deal! If you live in the Chicagoland area and would like to have a session with her, check out her website to get her contact info. If you are interested in taking a class, she instructs a HeartCore class on Tuesday evenings at 7pm, Thursday evenings at 6pm and Saturday mornings at 10am at UrbanCore Pilates & Fitness. They are hard but SO WORTH IT! If you can’t make it, copy and paste this circuit onto a word document, print it, and DO IT! After you start seeing results you will be happy you did! Angela M. Carini, B.S., AOBTA CP, PMA-CPT has over 10 years of experience in the fields of dance, bodywork, and mind-body fitness. She holds a Bachelors in Dance from Northwestern University and is a Certified Pilates Instructor through the Pilates Method Alliance. Angela is also an AOBTA Certified Shiatsu Practitioner and Instructor and has taught Shiatsu at the Pacific College of Oriental Medicine and Zen Shiatsu Chicago. She has authored a popular beginning level Shiatsu video entitled The Art of Shiatsu.